Whether you prefer it in your Bloody Mary or as a dip there’s no doubt that the distinctive taste of fresh celery is a welcome addition to salads, soups, smoothies and many cooked dishes. It can help to reduce blood pressure and prevent related cardiovascular diseases. It contains pthalides (organic chemical compounds that act to lower the level of stress hormones in the body). Pthalides have been shown to relax smooth muscles, allowing the blood vessels to expand. This creates more space and lowers our blood pressure (this process is known as vasodilation). This naturally reduces the chances of related cardiovascular diseases such as atherosclerosis, heart attacks and strokes. Powerful anti-inflammatory. This may have something to do with two special compounds present in this vegetable called luteolin and polyacetylenes. Luteolin has been shown to have a powerful inhibitory effect on certain enzymes responsible for the inflammatory process. Polyacetylenes reduce inflammation by lowering levels of inflammatory prostaglandins in the body. Arthritis sufferers are believed to benefit from high food sources of polyacetylenes. 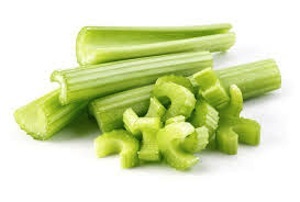 Celery is full of antioxidant compounds like flavonols, flavones, phenolic acids and furanocoumarins, which have shown to decrease the risk of oxidative damage to fats and lessen oxidative damage to blood vessel walls – preventing free radical damage. Whilst its natural diuretic and anti-inflammatory benefits make it a bit of an all-round disease prevention superstar. Celery’s excellent diuretic properties make celery a great choice for preventing bladder and other urinary tract infections. 1. Place bulgar in a heat-proof bowl and pour 2 cups of boiling water over it. Cover with plastic and et soak for 1 hour. Fluff with a fork. (Or prepare according to your package). Let cool to room temperature. 2. In the meantime, make the dressing. In a large bowl, combine lemon zest, lemon juice, thyme and sumac. In a slow steady stream, whisk in the olive oil. Season generously with salt and pepper. 3. 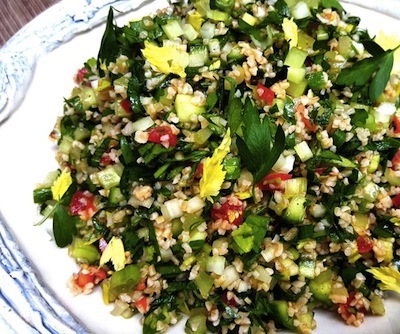 When bulgar is cooled, combine bulgar, baby celery, scallions, mint, and tomatoes with the dressing. Let the flavors marry at room temp for an hour (or longer, in the fridge). To serve, sprinkle with toasted sesame seeds and walnuts.